make it perfect: .Love for Pop. Sorry for the scarcity on the blog this week. It has been a busy and emotional week. Not in a devastatingly upset way, but it has been a time for reflection, reminiscing and celebrating the life of the man that so many of us love and call Pop. Pop lived to the age of 89...a couple of months more and he would have been 90. His health had taken a turn for the worse a few years ago and he had been sick on and off for quite awhile. He passed peacefully away in his bed last Monday, a bitter-sweet moment for all of his family and close friends. Although we are all sad that he is no longer with us to share his stories and love we are also happy that he is free from the infirmities his aged body presented him with. We are sad for Nan, that she no longer has her faithful companion by her side but know that this is the way things are supposed to be for a little while. We always used to joke around saying that when Pop eventually passed away (he was like the Energizer Bunny...always bouncing back when we thought this was "it"!!!) his funeral would be a huge event and it was! He was so well known and loved by everyone, it was touching to see family members and many, many friends of Pop's gather together to bid him farewell. His funeral on Friday was just beautiful. There were many tears shed. I will miss him dearly and it is sad to think that he isn't going to be here any more but most of the tears I shed were tears of gratitude and love for this great man who has been such a wonderful example to me and taught me so much throughout my entire life. He taught me to work hard and keep working at a job until it was completed and done well. He taught me about service and how important it is to look after those around you who are less-fortunate or in need. He taught me to love Jesus Christ and helped me to develop a testimony of Him. He taught me that it is important to have fun and joke and laugh, I have fond memories of Pop playing practical jokes on people after Sunday dinner and telling us the same old jokes over and over again - they were always funny when he told them though! He taught me to hold family close and make the most of the time we have with each other. Family is different from friends. He taught me to love the earth - I watched him work on his river flats day after day, week after week, year after year, keeping the entire acreage in pristine condition. I didn't realise what a wonderful job he did at this until just recently when we camped at the river flats and saw things from a different perspective and how much work must have gone into caring for it all. He taught me that you can achieve anything in life if you want it badly enough. Pop was from a very poor family, he couldn't read or write properly until he was a father himself, Nan was from a very wealthy family and her father did not want them to marry because he said that Pop would never amount to anything. Pop proved him wrong and ended up being one of the most successful farmers in the area! He taught me to slow down and enjoy the beauties of life for you never know when your time is going to be up. It was so wonderful to have all of the extended family together once again. My cousin Penny lives in the USA so she wasn't able to be there in the flesh, but did join us over Skype and was able to be a part of the funeral in that way. 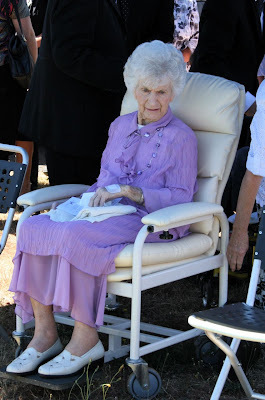 Nan and Pop have 6 children, 29 grandchildren and 58 great-grandchildren! Growing up we would get together each Christmas for a family lunch and usually a few other significant times during the year. Unfortunately as we have all grown older, married and had families of our own and many of us have moved away this doesn't happen very often anymore so it was very special to all be together. When planning his funeral awhile ago, Pop wanted one grandson from each of his children's families to be the pall bearers. I think he secretly did this because he knew it would make us all cry A LOT! :) It was just beautiful watching my cousins carry him to his grave and extremely emotional for everyone. 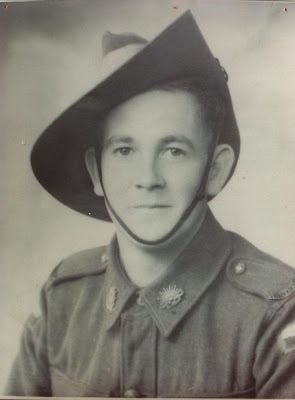 Pop was a WWII veteran and as his coffin was being lowered into the ground the boys held an Australian Flag over the grave as The Last Post was being played. 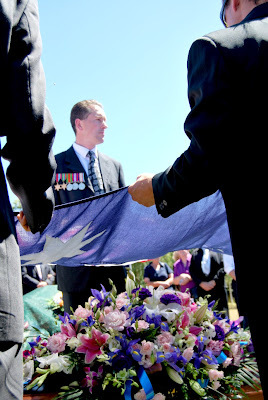 Our eldest cousin, Dion proudly wore Pop's medals from war during the funeral. It was all so fitting and appropriate as ANZAC Day has always been such an important event in Pop's life and for the rest of the family as we would gather together and watch him march down the street and pay our respects to him and the other men and women who served our country so valiantly at war. Nan was just perfect. She has always loved to buy new outfits, get dressed up and have her hair done and she was so beautiful. Pop always used to joke that she "was the best wife I ever had" (and he only ever had one!) and he is right...she is just adorable and a strong woman who is also a wonderful example to all of her family. Thankyou Pop for your life, your example and your love. Your legacy will live on. P.S. You can read more about Pop and how he has touched our lives on my cousin's blogs here, here, here, here and here. absolutely beautiful Tone, I loved your words and how Pop made everyone feel like you were something special. He instilled in all of us how to work and how lucky we are to have family. We were very lucky to have him for so long and to still have Nan with us. I will never forget what they have both done for me. Pop was truly a gentle giant in spirit. So lovely Tone. Summed Pop up perfectly. I was very strong and didn't cry this time :) Pop was an amazing man and how lucky we were to have him as our grandfather! I was touched by the way you described your family, the loss of your Grandfather and most of all, the lessons you learned from him. Beautifully said! I had tears in my eyes and will try to remember them in my life as well! My best wishes are for your Grandmother all the way from me in the Netherlands!